Do you have an outdoor space that is perfect for entertaining? I had always wanted to have people over on a warm summer night for a BBQ and then spend the evening talking and laughing with friends. And now I do! Creating this outdoor entertaining space was so much easier than I thought it would be! Here is our backyard before. It is a fairly small square with some grass and a vinyl fence. Nothing fancy. The Enbrighten Color Changing Café Lights is really what made this space so amazing. 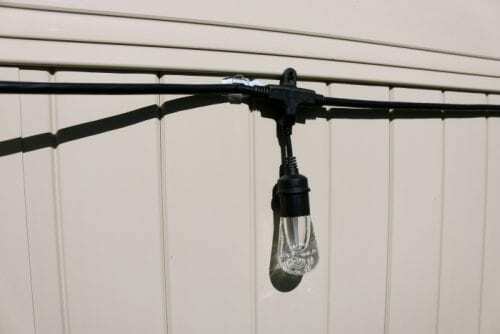 The bulbs are shatterproof so they are perfect for outdoors! Plus, they just look really cool! 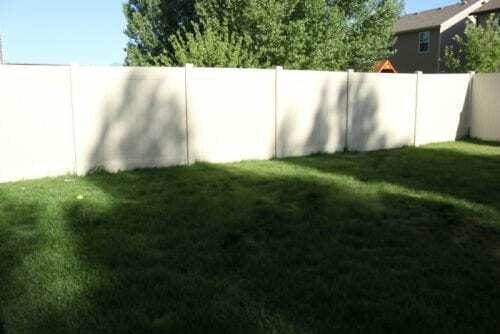 I only did a 24-foot section of my backyard, but you can easily do more since the strands are linkable up to 750! 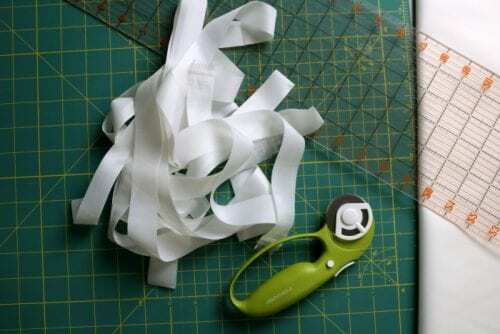 Begin by cutting the white nylon fabric into 1-inch strips. 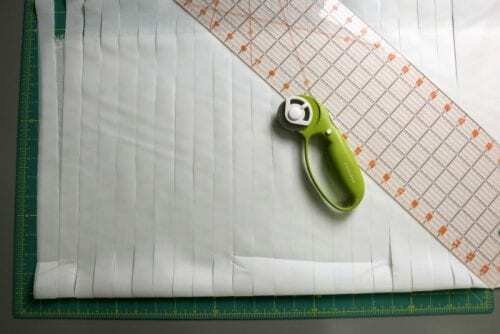 The easiest way to do this is to use a quilting mat, quilting ruler and rotary cutter. 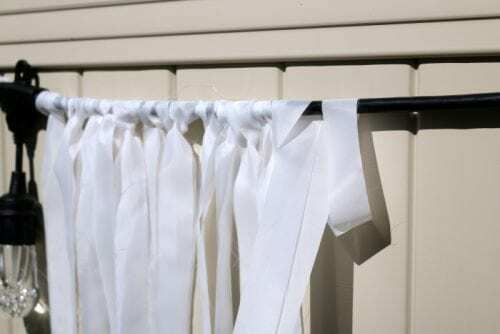 With a rotary cutter, cut through several layers of fabric at once. 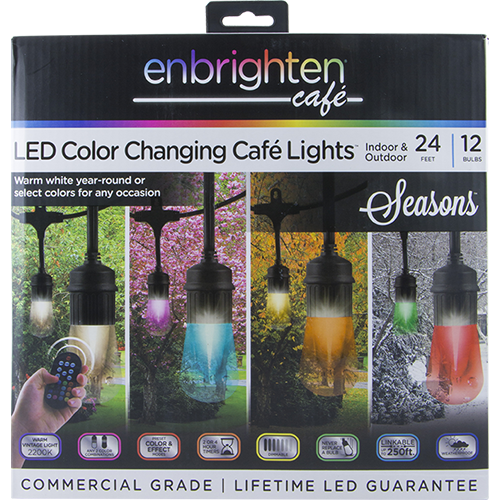 To attach the Enbrighten Color Changing Café Lights to the fence use Command Outdoor Light Clips to the fence line. 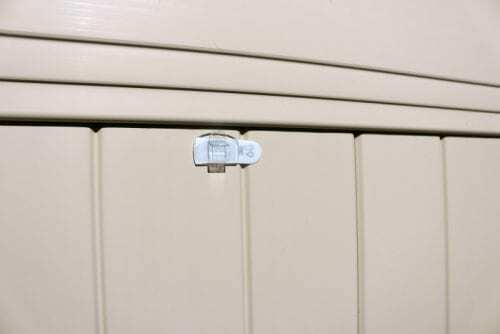 Command strips are great because there is no need to drill holes into the fence, and they are removable! I applied one outdoor clip right before each light and it held great! At the beginning of the strand ofEnbrighten Color Changing Café Lights there is a bigger box portion to the cord, apply a couple outdoor clips to this section to help distribute the weight of the box. At the beginning of the strand of Enbrighten Color Changing Café Lights there is a bigger box portion to the cord, apply a couple outdoor clips to this section to help distribute the weight of the box. 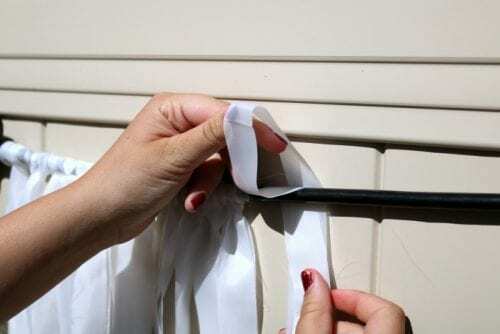 To add the strips of fabric, fold the strip in half and loop the ends through the folded top, wrapping the strips of fabric around the cord. Between each section of lights, we added about 20 strips of fabric. You could add more or less depending on the look you want. 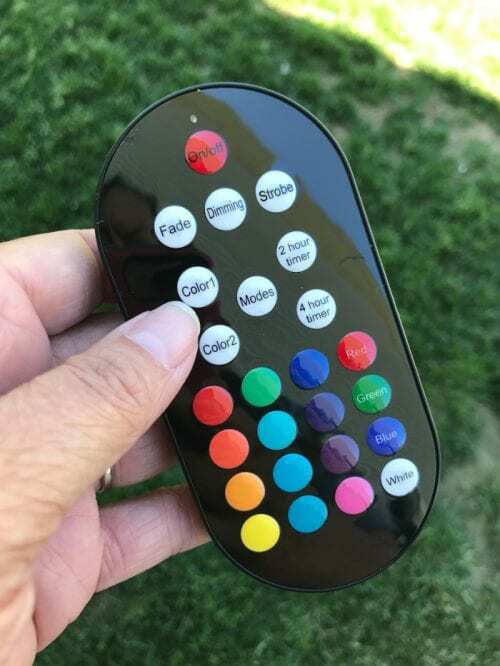 The Enbrighten Color Changing Café Lights came with a handy remote to set your color preferences. There are so many color options and combinations! You can change one light at a time or 2 colors simultaneously. If you get bored with one, you can easily change to a different color or combination with a click of a button. 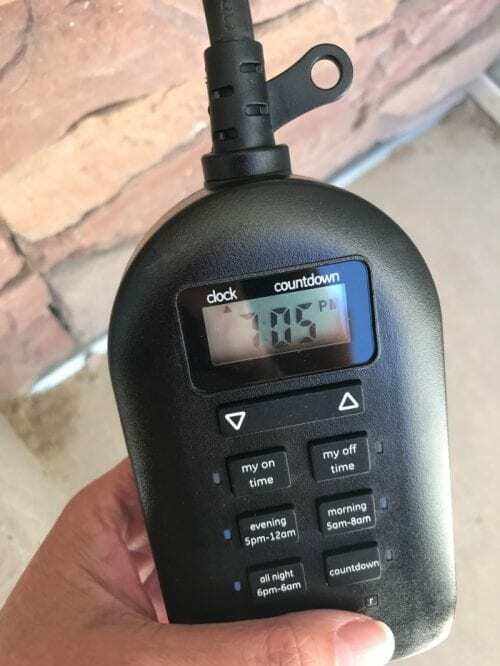 The myTouchSmart Outdoor Timer is an optional accessory that can be used to automate the Enbrighten Color Changing Café Lights. Enter your local time and easily select sections of time for the lights to be on every evening and/or morning! We added a couple of outdoor chairs to our outdoor entertaining space, and that was all it needed. Now we have a comfy place to sit and talk. We put the Enbrighten Color Changing Café Lights up during the day and I was very impatient for nightfall. I was so excited to see what the lights were going to look like. Using the remote, we set the Enbrighten Color Changing Café Lights to Strobe. 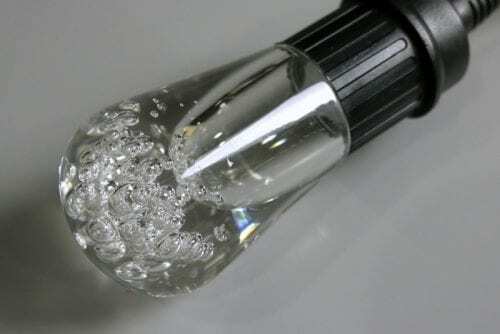 The strobe setting goes through the different colors of lights changing them without a fade. It was so fun to sit and talk while watching these beautiful lights change color behind us. 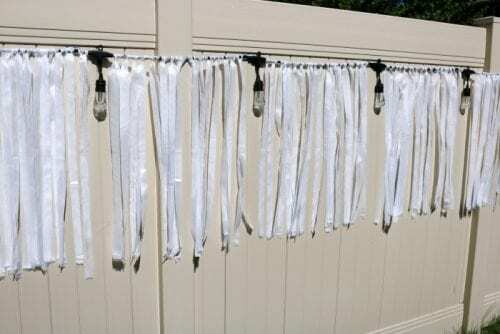 There was a small breeze and the wind moved the fabric strips as they caught the color from the lights. I am thrilled because I now have my outdoor entertaining space that I’ve always wanted, and I LOVE IT! What are you dreaming up for your Outdoor Entertaining Space? Share and leave a comment below! For more amazing ideas on how to customize your space inside or out, check out this Pinterest Board. 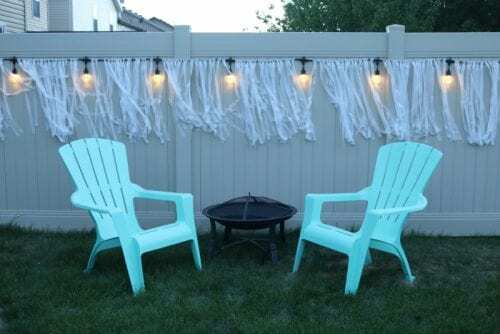 SAVE HOW TO MAKE AN EASY OUTDOOR ENTERTAINING SPACE TO YOUR FAVORITE DIY PINTEREST BOARD!